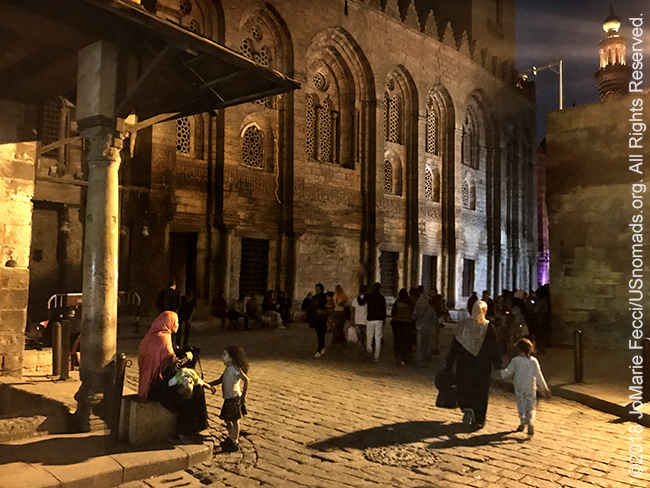 CAIRO, EGYPT (29 March 2018) — An evening walk through the souk in the center of “Old Cairo” was a pleasant way to get a quick sense of the city’s soul. 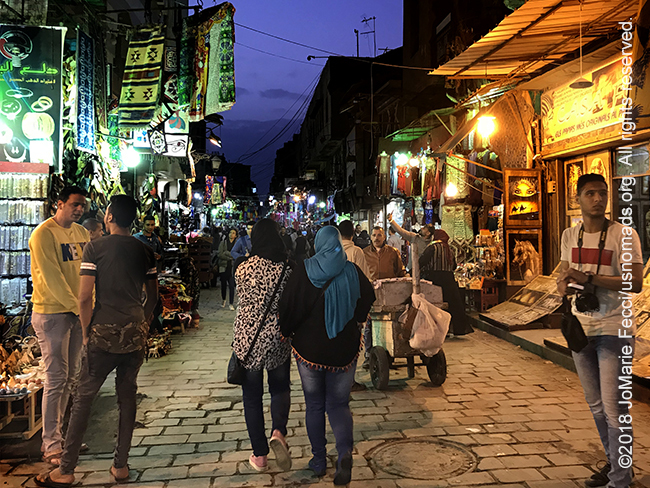 While tourists are welcome and encouraged, this is truly an Egyptian market with plenty of locals shopping for various commodities or just hanging out with friends. Though bustling and vibrant, there is an easy, fun, and light-hearted ambiance, with commerce mixed in. A stop for coffee and a friendly chat is a quick way to feel something of the softer side of daily life in what can be a hard-edged town. This market is one of the oldest places in the city and was once a meeting point for caravans coming from Africa and Asia. The trade routes that met here existed even in ancient times as the presence of lapis lazuli from Afghanistan found in Egyptian tombs attests. In ancient Egypt there were two important caravan routes to the north and one to the south. One of the northern routes went via Palestine up along the Mediterranean coast, while the other ran along the Litani River via Syria. 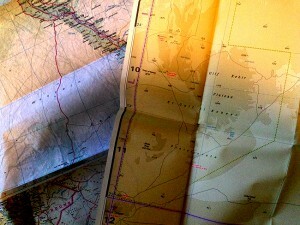 The southern route led to the gold and riches of Nubia. The “Darb el-Arbain” or “Forty Days route,” passing through Kharga in the south and Asyut in the north, was a long caravan route that ran between Egypt and the Sudan. Used for the transport and trade of gold, ivory, spices, wheat, animals and plants from as early as the Old Kingdom, it was lined with forts and outposts by the ancient Romans who wanted to protect the flow of trade. At its longest point, the Forty Days route went northward from Kobbei, 25 miles north of al-Fashir, through the desert, via Bir Natrum and Wadi Howar, to Kharga and Asyut in Egypt. The sprawling market area of the modern Khan el Khalili grew up in the 14th century. Originally the site of a mausoleum known as the turbat az-za’faraan (Saffron Tomb), it was the burial place of the Fatimid caliphs in the Great Eastern Palace complex built in 970 AD by Gawhar al-Siqilli, the general who conquered Egypt and founded the city of Cairo. The mausoleum was demolished under the first Mamluk Sultan, in the late 14th century, and replaced by a large caravanserai for visiting merchants and their goods. The caravanserai was situated at the middle of Cairo’s most important zone of economic activity, extending along the city’s main north-south axis, and many monumental religious complexes and commercial establishments were built there during the Mamluk period. By the late 15th century, the district around Khan el-Khalili had become the major center of foreign trade, including the sale of slaves and precious stones. In the early 16th century, Sultan al-Ghuri, Egypt’s last powerful Mamluk sultan (1501-1516), modified the district, demolishing the original caravanserai built by al-Khalili and replacing it with a monumental commercial complex in a grid plan. The new central bazaar had covered streets and was protected by locked gates at night. Parts of this structure are still visible today, including an ornate gate and the upper stories whose facade is lined with iron-grilled windows where merchants’ rooms were located. Two other monumental gates, the Bab al-Badistan and the Bab al-Ghuri, also date from this time and are still standing today. The district became associated with Turkish merchants, and during the Ottoman period the Turkish community of Cairo was centered here. Today Khan el-Khalili is mainly occupied by Egyptian rather than foreign merchants and large parts of it are geared towards tourists, though many traditional workshops continue to operate in the area. There are also coffeehouses, restaurants, and street food vendors throughout the market. We stopped at one of the coffee sellers where Nahla could buy a few kilos of a favorite blend to bring to her family, and while we were there tasted an excellent brew that mixed beans from Ethiopia with a nice hint of cardamom.